For the less developed northwest region, enhanced transport means increased investment, more jobs and development opportunities. Each year, locals make more than 100,000 trips to leave home to find jobs as migrant workers. LANZHOU, July 9 (Xinhua) -- A new high speed railway linking Baoji city in northwest China's Shaanxi Province with Lanzhou, capital of neighboring Gansu Province, started operation Sunday. Thanks to the new route, northwest China's Gansu and Qinghai provinces as well as Xinjiang Uygur Autonomous Region have been connected to the national high-speed rail network. It also marks the expansion of a high-speed rail line along the ancient Silk Road, a trade route which connected China and Eurasia two thousand years ago but used to take months for people to travel on camelback. The Baoji-Lanzhou high-speed rail is 401 kilometers long with an operation speed of 250 km per hour. Construction began in 2012. The rail line slashes the travel time between Xi'an and Lanzhou to three hours from the previous six hours, according local rail authorities. The 1,776-km Lanzhou-Xinjiang high-speed rail was operational at the end of 2014, but was unable to reach central and eastern China as the Baoji-Lanzhou line was still under construction. The new rail line is part of China's efforts to boost connectivity along the Belt and Road, where transportation demand is surging as regional ties and cooperation keep strengthening. By linking key cities along the ancient silk road such as Xi'an, Lanzhou, Xining and Urumqi, the new route is expected to boost outbound passenger flow from the northwest and improve transport capacity on the Eurasian rail corridor. In less than two hours, train tickets for the newly-opened Baoji-Lanzhou were sold out after pre-sale started Thursday afternoon. "Now that the railway has opened, my wife and daughter can come and visit me more often," said a Kazakhstani student in Xi'an who adopted the Chinese name of Mi De. He said he used to fly from his hometown to Urumqi and then spend more than 30 hours on train to travel from Urumqi to Xi'an. As part of the national network, the new route also makes it easier to visit the ancient silk road, home to countless natural scenery and historical sites such as snow-capped mountains, forests, deserts and the Maiji Mountain Grottoes. Train travel into the northwest region is no longer tedious, and it is now only a nine-hour trip from Shanghai in the east to Lanzhou city, down from the previous 23 hours. China had built more than 22,000 km of high-speed rail lines by the end of last year. The mileage will increase to 45,000 km by 2030. Ma Tao, an official with the local railway bureau of Lanzhou, said he expected fresh tourism opportunities for the regions along the new rail route. To promote regional tourism, photos and brochures are now distributed on trains between Lanzhou and the eastern Xuzhou city, while visitors can enjoy discounts on local tours and accommodation with high-speed railway tickets. Meanwhile, as more tourists are attracted to high-speed rail, freight transport on slower railways such as the Lianyungang-Lanzhou Railway will receive a boost. Cutting one pair of passenger trains on the Lianyungang-Lanzhou Railway will help add two to three freight trains on the same line, each with a capacity of 1 million tonnes, according to Xu Jiangen, deputy chief engineer with Xi'an railway bureau. For the less developed northwest region, enhanced transport means increased investment, more jobs and development opportunities. In Tongwei, one of the most impoverished counties in Gansu, the Baoji-Lanzhou high-speed rail has for the first time connected the area with many of China's major cities such as Beijing, Guangzhou and Wuhan. This station is the largest railway station in Asia. 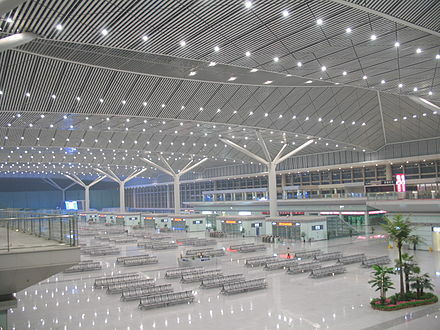 The station currently has 34 platforms, providing high-speed railway services.